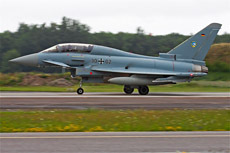 On Thursday, June 30, 2011, I had a visit at Neuburg Air Base in the southern part of Germany. 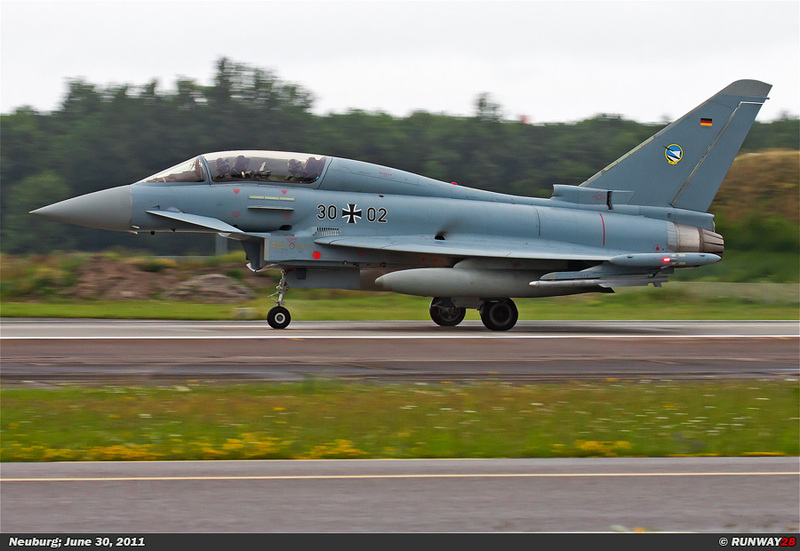 Neuburg is, after Laage in the northern part of the country, the second base which received the EF2000 Eurofighter. 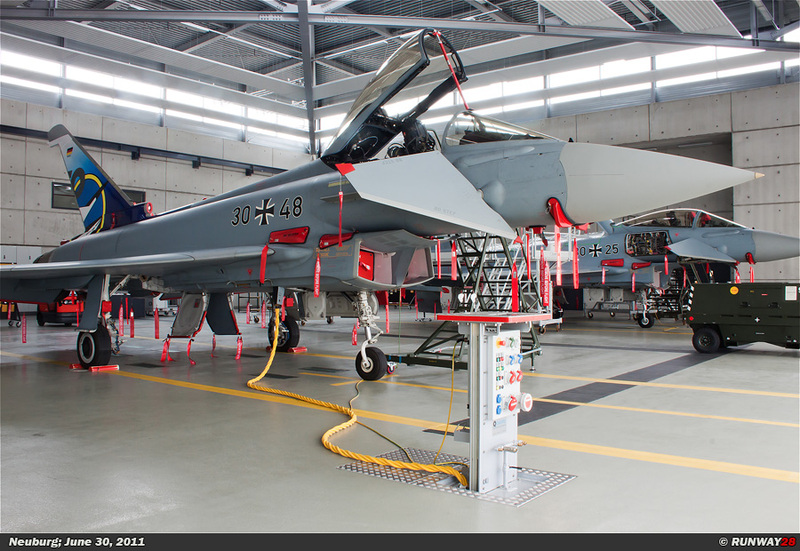 JG-74 currently operates with 20 Eurofighters. 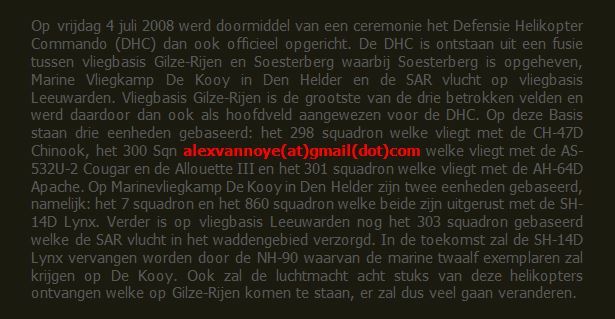 This number will rise to approximately 30 aircraft. 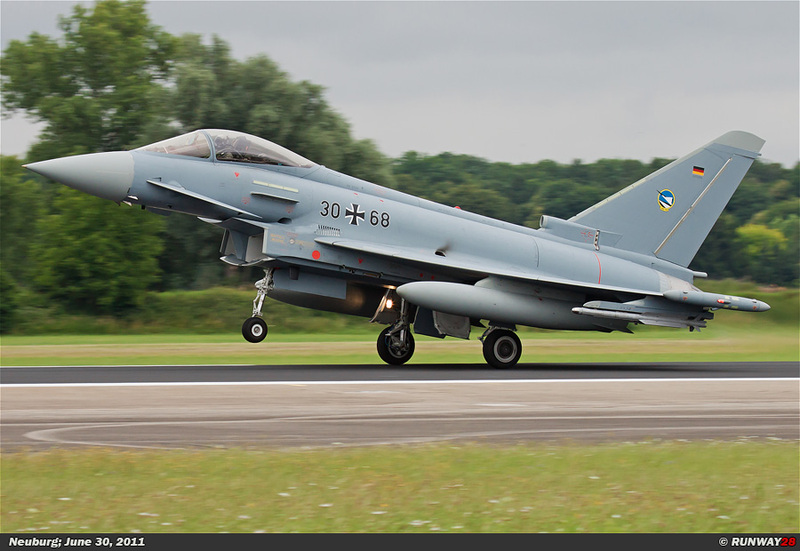 The Eurofighter Typhoon is a twin engine aircraft with delta wing configuration with canards. 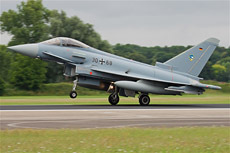 The Eurofighter is a multi-role combat aircraft designed and built by a consortium of three companies, namely; EADS, Alenia Aeronautica and BAE Systems. 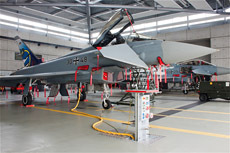 These companies work together through the holding company Eurofighter GmbH which was founded in 1986. 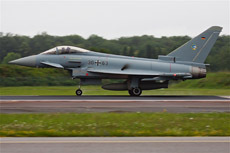 The project is led by the NATO Eurofighter and Tornado Management Agency. 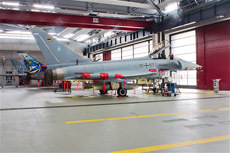 This agency serves as the main customer for the Eurofighter. 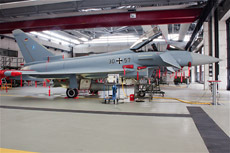 The series production of the Eurofighter Typhoon is still in progress. The aircraft is currently in use at the German Luftwaffe, the British Royal Air Force, the Italian Air Force, the Spanish Air Force, the Austrian Air Force and the Royal Saudi Air Force. 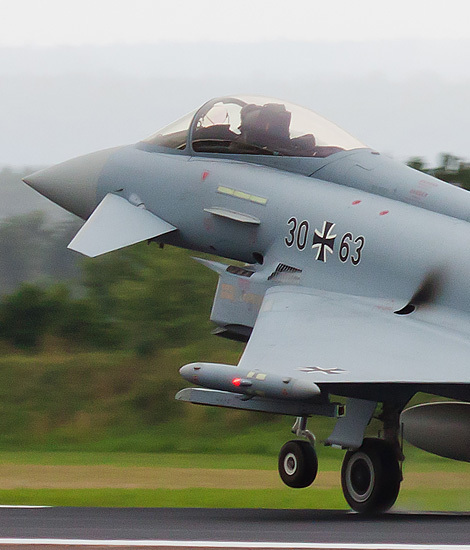 Great Britain had already in 1971 the requirements for the new generation of fighter planes. A specification for the AST 403 was issued by the Air Staff in 1972. This resulted in a conventional design which became known as the p.96. 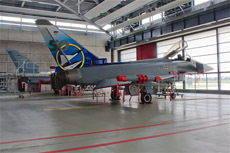 The design would have met the Air Staff's requirements. The British aviation industry was a conservative business, because the demands were very much like those of the American F/A-18. The design had little potential for future growth, and it would not get many production orders if it went into production. The West-German government demanded a new fighter design in 1979 simultaneously. This would have led to the development of the TKF-90 concept. 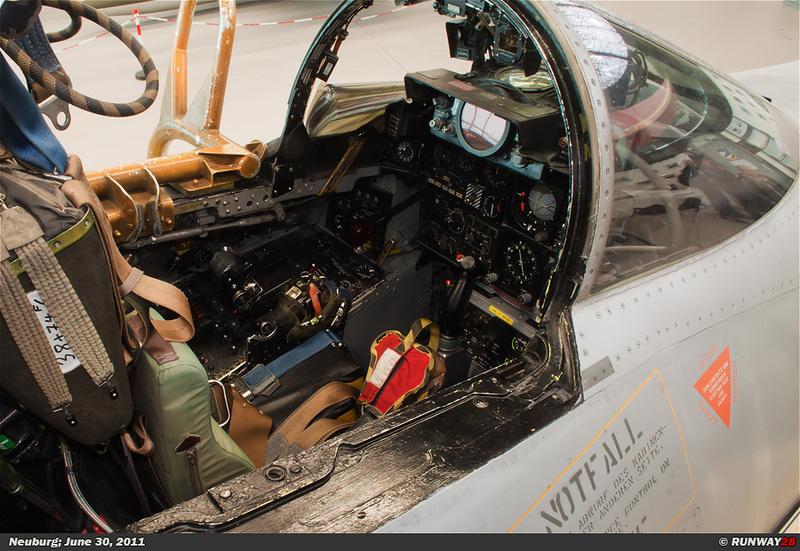 This aircraft was a delta wing design with canards on the front and fly-by-wire steering. 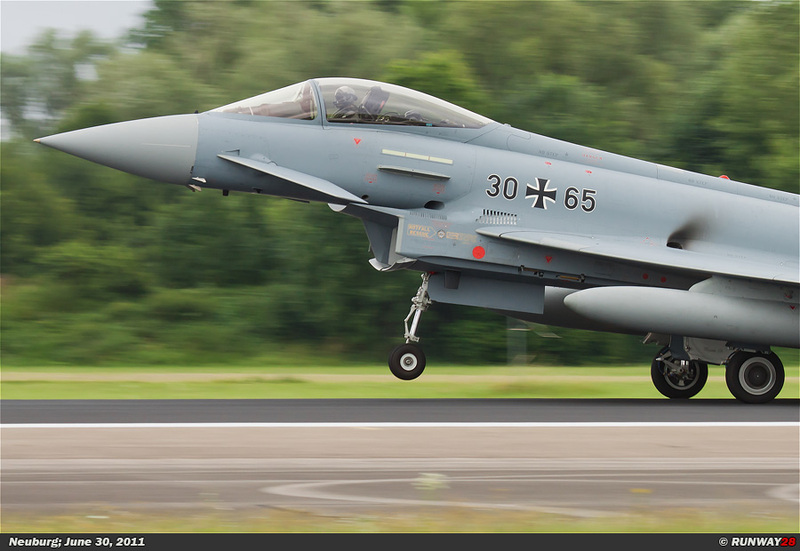 The British and German designs were very similar in performance. British produced 2 designs. 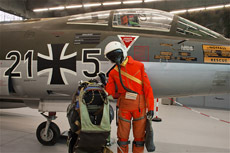 The first design was a single engine lightweight fighter which was called the p.106. 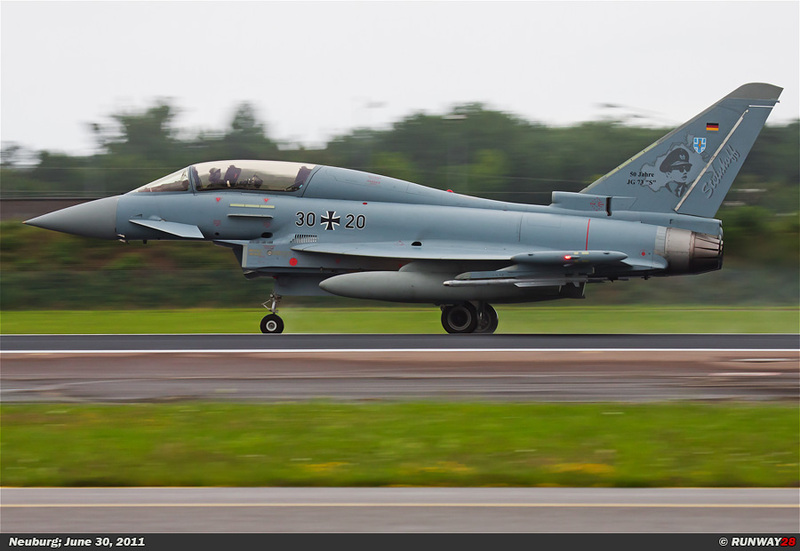 The aircraft had many similarities with the JAS-39 Grippen. The second design was the twin-engine fighter which was called the p.110. 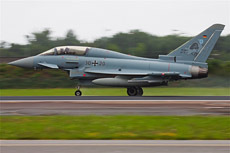 The p.106 concept was rejected by the RAF, arguing that it had half of the effectiveness of the twin-engine aircraft while it had two third of the costs. 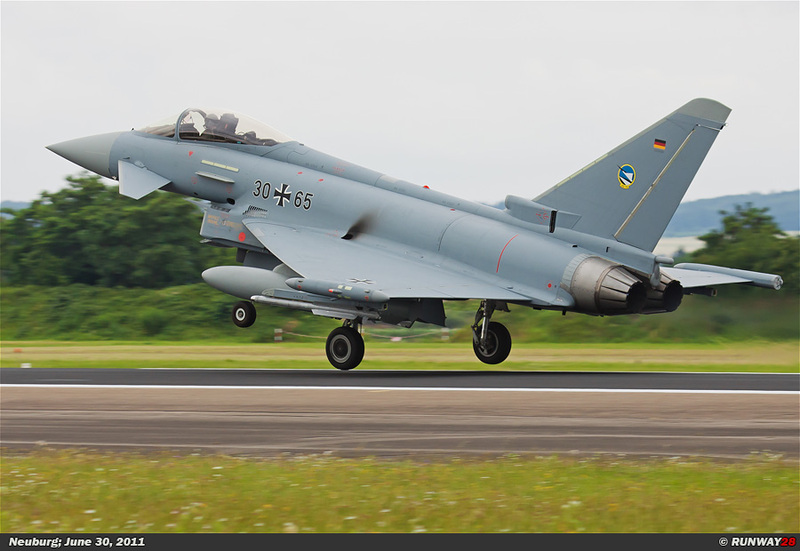 West-Germany continued to refine the TFK-90 concept. 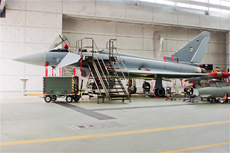 Dassault insisted to be in charge of the project in 1981. The British had proposed to use the new RB199 engine for the project, but the French preferred the Snecma M88. 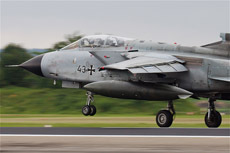 The Panavia partners MBB, BAe and Aeritalia, which also developed the Tornado, started in 1982 with the Agile Combat Aircraft (ACA) program. This aircraft was similar to the British p.110. Germany, France, Great-Britain, Italy and Spain launched the Future European Fighter Aircraft (FEFA) program in 1983. This was the result of merging the ECF project with the ACA project. 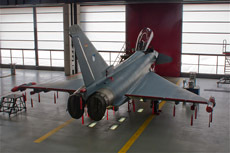 France reiterated its demand for a carrier version of the project in 1984. They also demanded to be a key role developer during the FEFA project. 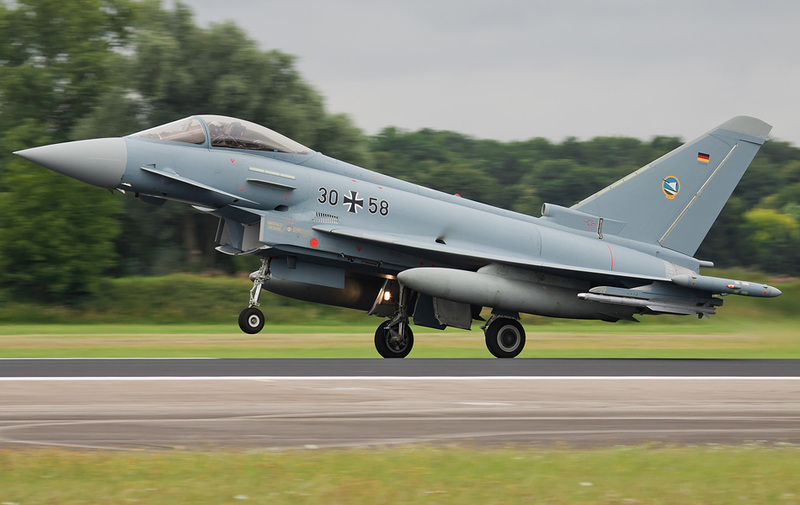 West-Germany, Great-Britain and Italy opted for a new EFA program and they decided to go for the Eurofighter on August 2, 1985. France and Spain decided not to proceed with this project, partly because of the French demands. 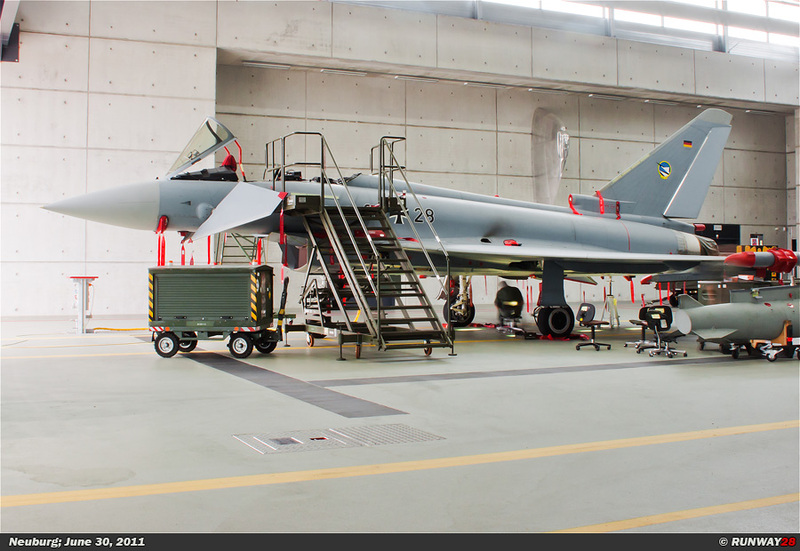 Spain came back to the Eurofighter project in early September 1985 despite pressure from France. France withdrew from the project and started its own ACX project. This project would later become the Dassault Rafale. Today I had a visit at Neuburg in the morning hours after a great day at Lechfeld and Kaufbeuren. Today’s weather conditions were dramatic compared with yesterday. It was gray and it rained from time to time. Once arrived, our guide brought us to a small museum which is located on the base. 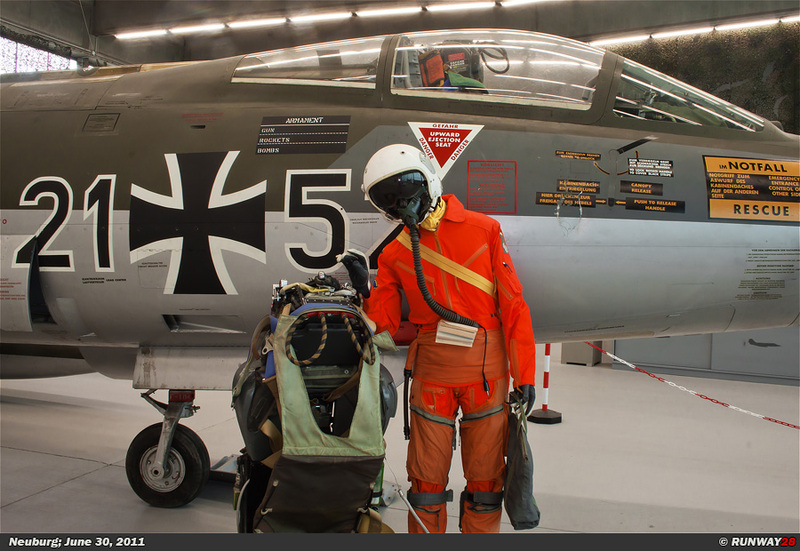 There were an F-4 Phantom, an F-86 Sabre and an F-104 Starfighter present in this museum. Our guide told us in the meanwhile that we were lucky today, because there were 7 Eurofighters on the flight plan for the morning hours. 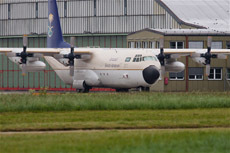 The aircraft would leave to Sardinia for an exercise of 2 weeks. 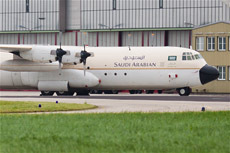 We were brought at about one third of the length of the runway after the short visit to the museum. 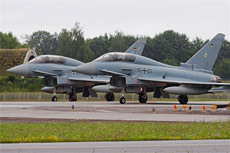 The first Eurofighters appeared at the checkpoint after a few minutes. It was 1 EF2000 and 2 EF2000Ts. One of the 2 seaters had a special paint of JG-73 on the tail. 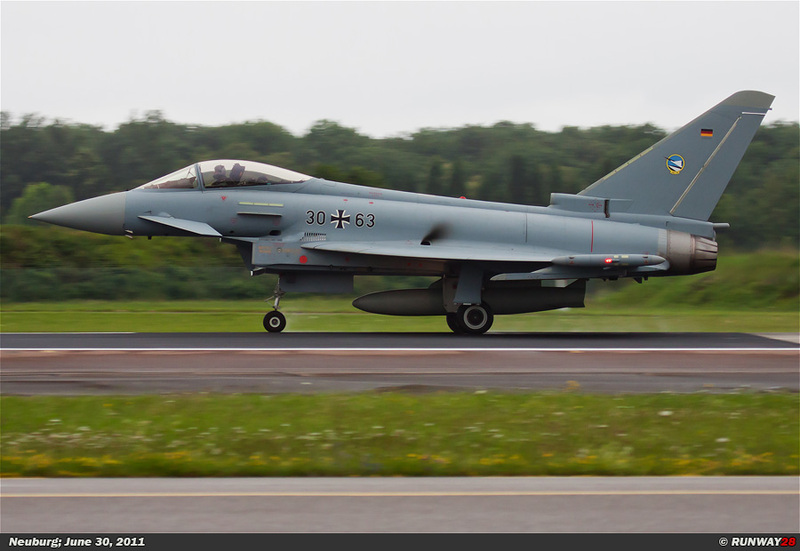 This aircraft was temporarily borrowed from JG-73 by JG-74 because they do not have many Eurofighters at this moment. The weather during the take-off of the 2 aircraft was very dark. 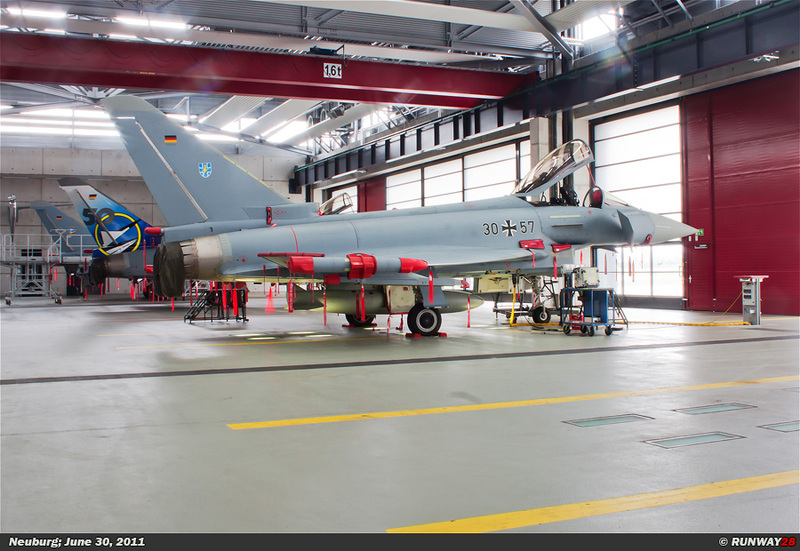 We took a look in the maintenance hangar after the departure of the first wave. 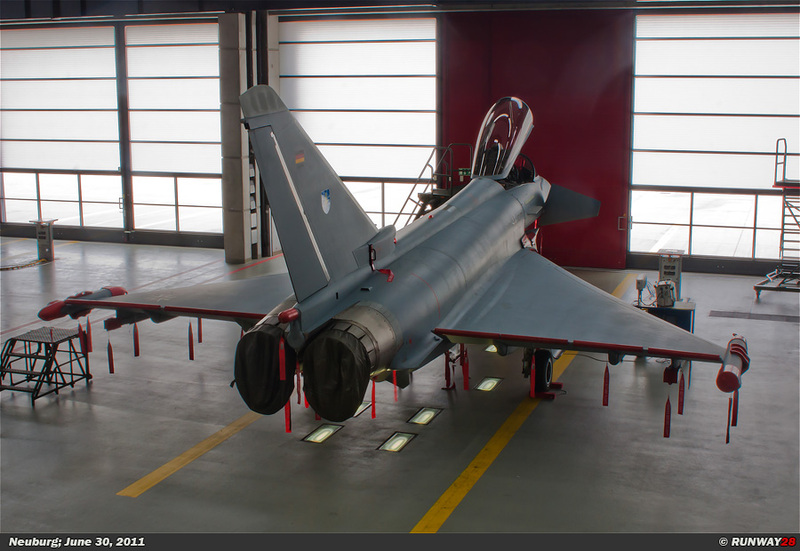 It surprised me that we were allowed to take photos of almost all the aircraft in this hangar. In total there were 4 Eurofighters present in the building. 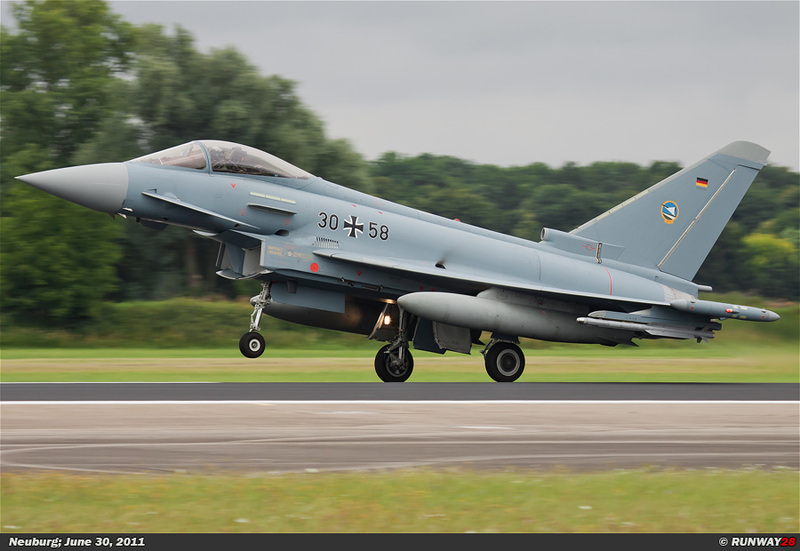 The most beautiful aircraft was the Eurofighter with the big JG-74 logo on its tail. The light in the hangar was very bright and therefore it was very easy to shoot a few decent photos. After a brief visit to the hangar, we walked back to the runway. 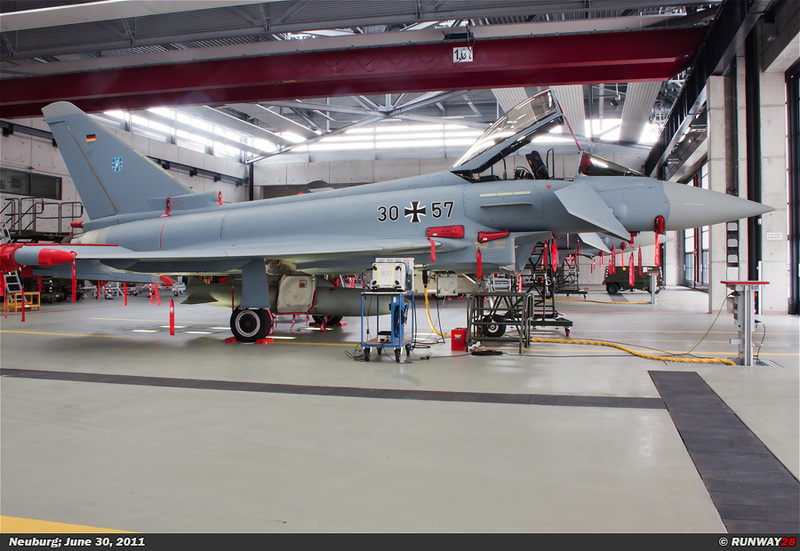 We heard a lot of noise during our visit in the maintenance hangar. 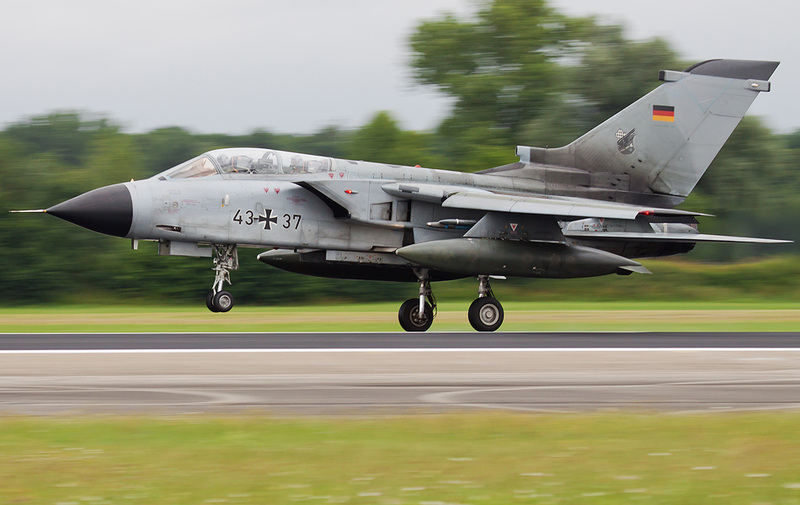 A Tornado IDS from Lechfeld was in the circuit of Neuburg. 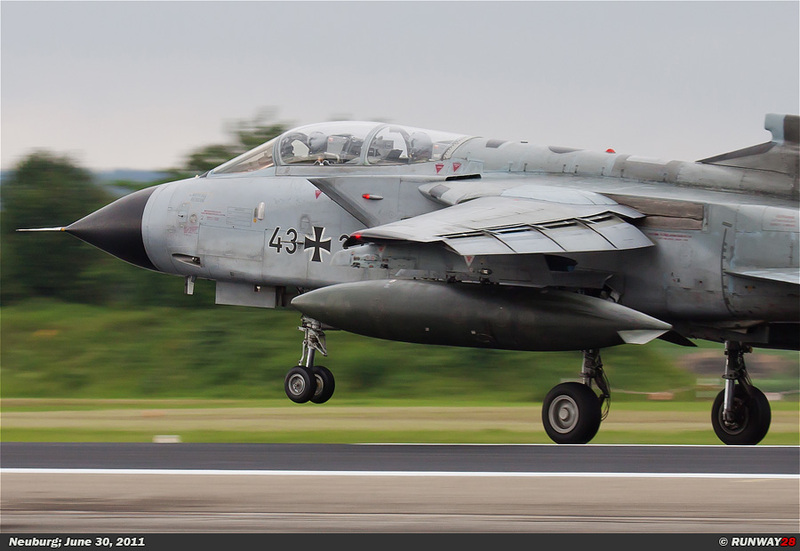 I managed to shoot some great panningshots of the Tornado. 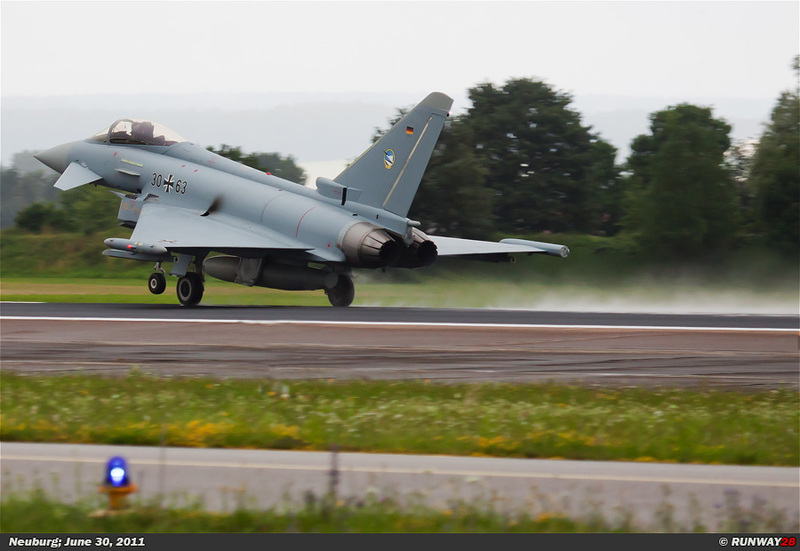 The second wave of Eurofighters was preparing for departure in the meanwhile. The last 4 planes which would depart to Italy appeared at the head of the runway. 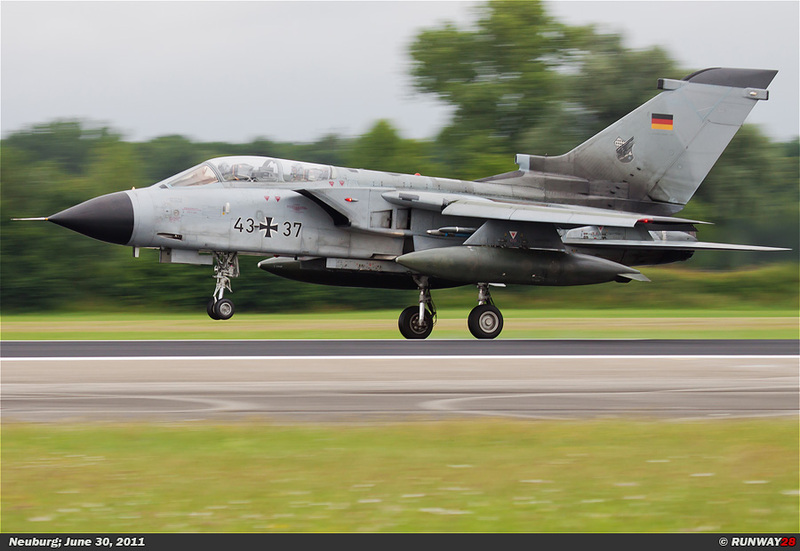 This wave consisted of 4 single seat EF2000s. 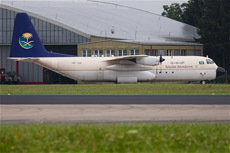 A Transall from Landsberg landed after the departure of this wave. 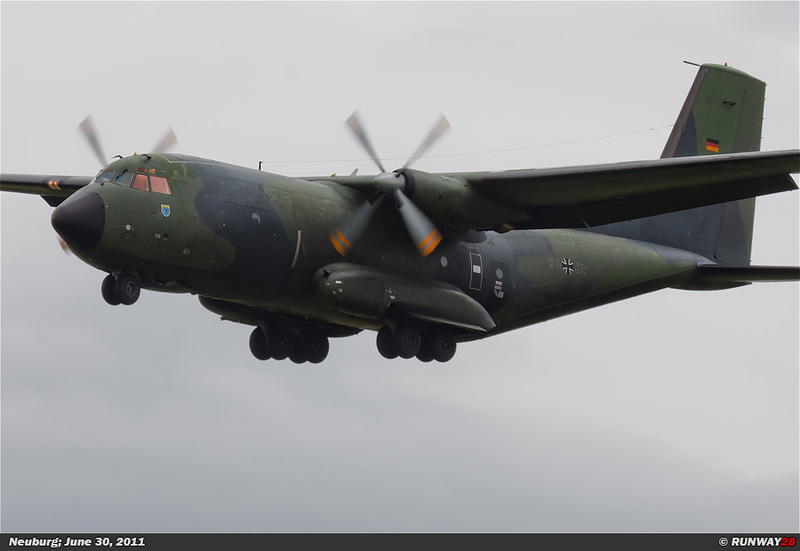 Our visit at Neuburg was over after the landing of this C-160. 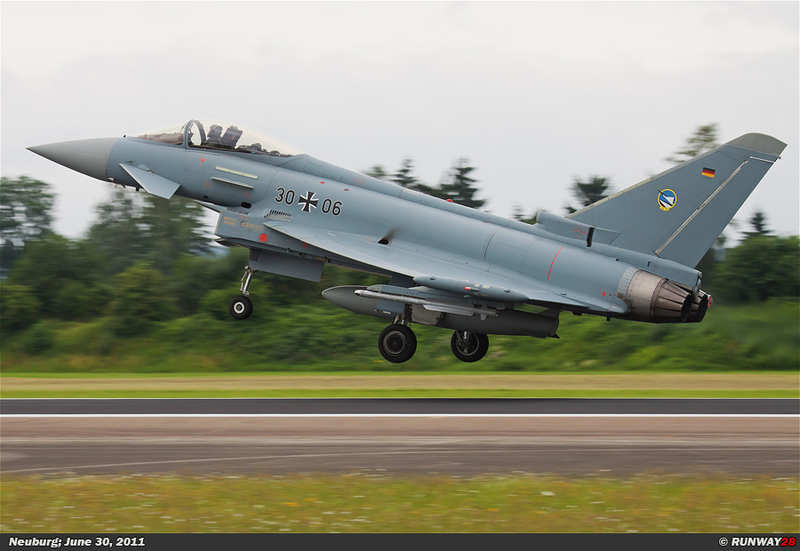 I would leave to Austria for the Air Power at Zeltweg after this wonderful visit. During our journey there, we would stop for a moment at Linz-Hörsching. 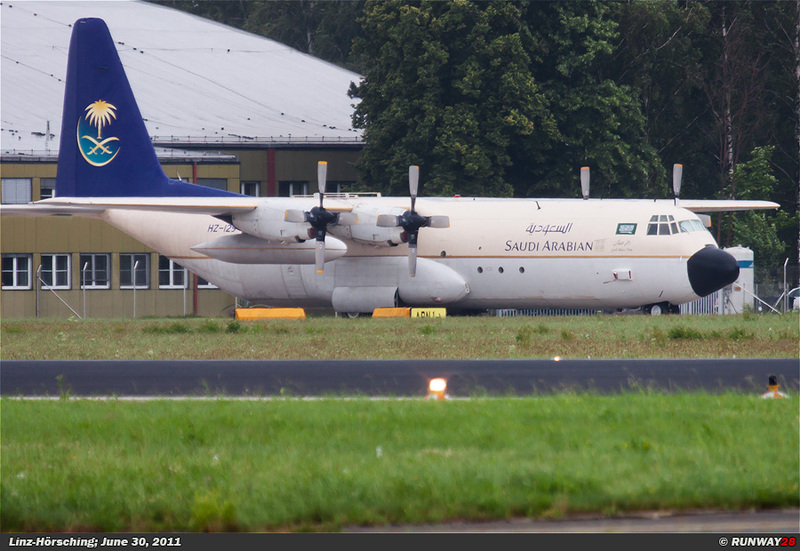 There were 2 Arab Hercules aircraft on the platform. 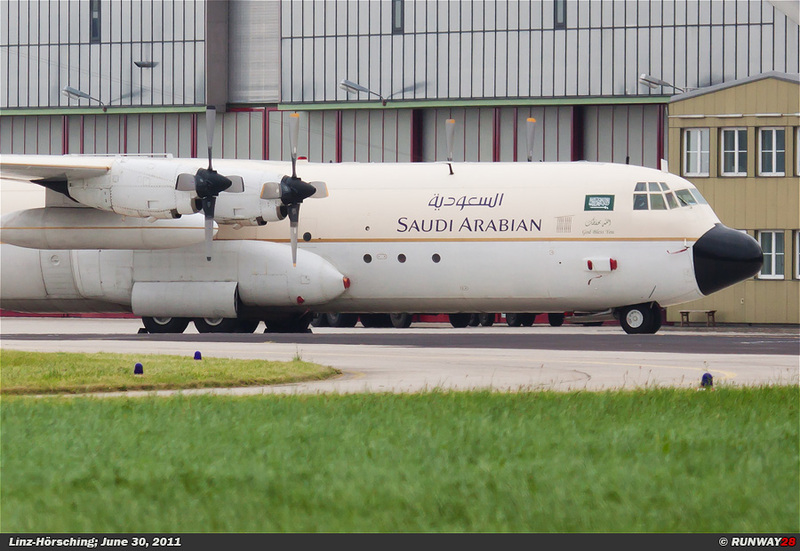 The aircraft were parked close to the fence and therefore it was not difficult to make some photos. 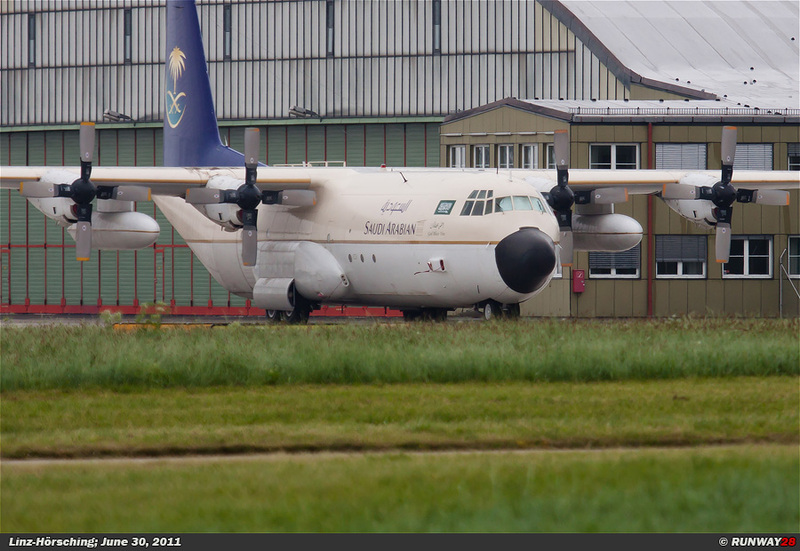 These 2 aircraft were a nice contribution for today’s score. 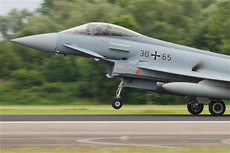 I would look forward to the Air Power 2011 at Zeltweg tomorrow.